The charity has ramped up its publicity, using Facebook to supplement more traditional crowd-pullers such as press and TV advertising, and is confident of topping the half million people who took part last year. Go here to register – all you need to do to take part is log the birds that visit your garden or local park over a one-hour period on either January 29th or 30th and report your finding back to the RSPB on the Big Garden Birdwatch website. 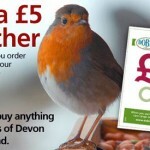 Registering on the Birdwatch site also entitles you to a 10 per cent discount on bird food, while anyone who goes a step further and actually joins the RSPB as an adult or family member by March 31st gets a free RSPB classic apex nest box. Categorised under Big Garden Birdwatch, tagged under RSPB.